At just 24 years old, a sharp-eyed observatory assistant made astronomical news 75 years ago at the Lowell Observatory in Flagstaff, Arizona. In 1930, Clyde Tombaugh discovered what some astronomers had declared impossible, and others had been searching for, for a quarter century-a ninth planet in our solar system, later named Pluto. 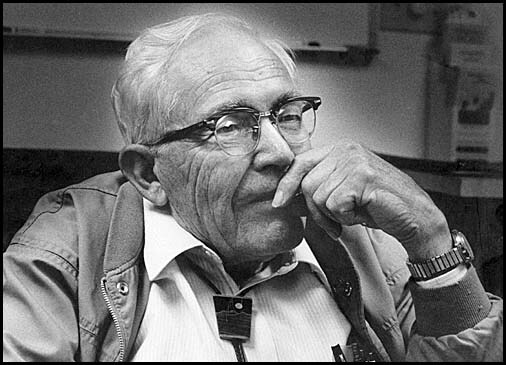 Tombaugh’s dream as a farm boy in Burdett, Kansas, had been to go to college and become a professor. From age 12, he had spent every clear night scanning the skies with a borrowed telescope and had read every astronomy book he could find. When his passion required a more powerful telescope, he built his own, grinding the mirrors himself. Three years after high school graduation, discouraged by crop failures, Tombaugh decided to look for a job, maybe on the railroad. At the same time, he sent meticulous drawings he had made of Jupiter and Mars to the Lowell Observatory for an opinion. Impressed, the director offered him a trial assistantship. Tombaugh bought a one-way train ticket to Arizona. His diligence and young, sharp eyes paid off. On February 18, 1930, he found a tiny dot, orbiting very close to Lowell’s prediction, on a pair of photos he had taken in January. After just thirteen months of work, Tombaugh’s discovery rocked the astronomical and academic world. A year later Tombaugh entered the University of Kansas on a four-year scholarship-genuinely surprised when professors there refused to let the planet discoverer enroll in introductory astronomy. This year also marks the fiftieth year since Clyde and his wife, Patsy, helped found the Unitarian Universalist Church of Las Cruces, New Mexico. While at university, the couple had visited Unitarian churches in Kansas. When Clyde joined New Mexico State University in 1955 to found its now-renowned astronomy program, they joined students interested in starting a church. Patsy, the only living charter member still at the church-Clyde died in 1997-says her husband was known for his puns: When the clock at the back of the church stopped working one Sunday morning, he quipped, “I’m so sorry that clock had such an untimely death.” She still has the telescope he made as a boy and a two-story-high one he constructed in their back yard. Tombaugh will always be best known for the earthshaking discovery he made before his illustrious career had even begun. He went on to develop innovations in telescopic instruments and to photograph two-thirds of the sky-discovering six star clusters, two comets, hundreds of asteroids, several dozen clusters of galaxies, one supercluster, and a rare exploding nova.